Canon Color imageCLASS MF820Cdn Review - Designed to help users complete tasks quickly and efficiently, the Canon imageCLASS MF820Cdn's advanced capabilities deliver impressive, customizable usability while also saving space. The MF820Cdn features a 3.5” color touch panel with adjustable angles. 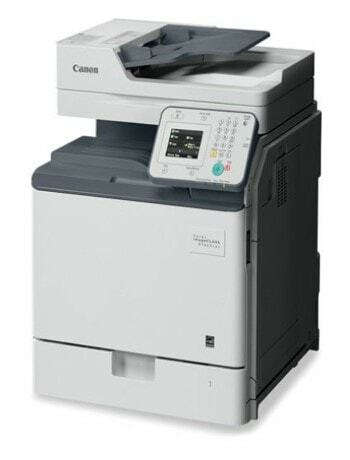 The Canon MF820Cdn combines all print, copy, scan and fax needs for small and medium business users. This machine has several different hardware and software configurations to fit the specific needs of its users. In today's Mobile world, effective business people need to be productive wherever they are. Print and scan on the go from your laptop, tablet, or smartphone in a flash with any of Canon's mobile print solutions, including Apple AirPrint and Mopria Print Service for Android users. The Canon imageCLASS MF820Cdn model incorporates innovative, eco-conscious solutions that help keep your business operating efficiently while helping to reduce your environmental footprint. Seamlessly navigate through features with the first imageCLASS color 3.5" customizable touch-panel LCD. Achieve vibrant and vivid images with the introduction of V2 Color Technology. Boost productivity with blazing fast double-sided print and copy speeds! Up to 36 pages per minute. Revolutionary Insulated Air Pressure toner technology helps control toner flow for stable toner supply and improved operability. Standard high-capacity, 550-sheet cassette plus 100-sheet Multipurpose Tray. Limit interruptions with up to three additional 550-sheet cassettes (Allows up to 2,300 sheets). Efficient Energy Saver mode uses approximately 1.0 W in Sleep mode. Print, Scan, Go with Apple AirPrint and Mopria Print Service. Scan and Search your documents with Optical Character Recognition (OCR) PDF scanning.